Eagles fly alone at high altitude and not with sparrows or other small birds. No other bird can get to the height of the eagle. Stay away from sparrows and ravens. Ravens will make you lose focus. 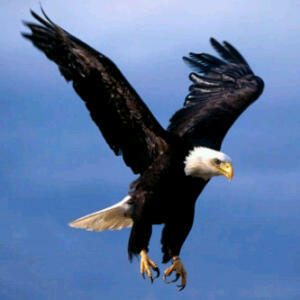 Ravens are not always HappƔ‎​‎​ when you succeed. Ravens will not add value to you so don’t fly with them…..
Look around you today and stay away from people with “ravenic” views. Eagles have strong vision. They have the ability to focus on something up to five kilometers away. When an eagle sites his prey, he narrows his focus on it and set out to get it. No matter the obstacles, the eagle will not move his focus from the prey until he grabs it. Have a vision and remain focused no matter what the obstacle and you will succeed. Eagles do not eat dead things. They feed only on fresh prey. Vultures eat dead animals, but eagles will not. Let me share a personal story with you; i love music with a passion; soulful ones at that but i used to love the genre of music, hard rock even more. i could tell you the name of rock stars that reigned in the 80’s. That was how passionate i was. But one day i listened to a motivational tape by a great man of God and‎​ he said “music with dirty lyrics deaden the spirit mind and‎​ would not allow you hear from your maker….truly it does. Be careful with what you feed your eyes and ears with, especially in movies and on TV. Steer clear of outdated and old information. Always do your research well. clouds. This gives the eagle an opportunity to glide and rest its wings. In the meantime, all the other birds hide in the leaves and branches of the trees. Let me share with you the story of one of my good friends, Roy. He had to make a huge decision when he was invited for one of the crucial stages of the project fame competition (season 4). He was refused a short leave and was given the option of resigning which he took! He rose to greater heights in a space of week. Today i decree no matter that storm in your life, you shall rise to great heights. Amen! challenges and use them profitably. The Eagle tests before it trusts. When a female eagle meets a male and they want to mate, she flies down to earth with the male pursuing her and she picks a twig. She flies back into the air with the male pursuing her. falls to the ground. He then brings it back to the female eagle. The female eagle grabs the twig and flies to a higher altitude and then drops the twig for the male to chase. This goes on for hours, with the height increasing until the female eagle is assured that the male eagle has mastered the art of catching the twig which shows commitment. Then and only then, will she allow him to mate with her. Whether in private life or in business, one should test commitment of people intended for partnership. When ready to lay eggs, the female and male eagle identify a place very high on a cliff where no predators can reach. The male flies to earth and picks thorns and lays them on the crevice of the cliff, then flies to earth again to collect twigs which he lays in the intended nest. He flies back to earth and picks thorns laying them on top of the twigs. He flies back to earth and picks soft grass to cover the thorns. When this first layering is complete the male eagle runs back to earth and picks more thorns, lays them on the nest; runs back to get grass it on top of the thorns, then plucks his feathers to complete the nest. The thorns on the outside of the nest protect it from possible intruders. Both male and female eagles participate in raising the eagle family. She lays the eggs and protects them; he builds the nest and hunts. During the time of training the young ones to fly, the mother eagle throws the eaglets out of the nest. Because they are scared, they jump into the nest again. Next, she throws them out and then takes off the soft layers of the nest, leaving the thorns bare When the scared eaglets again jump into the nest, they are pricked by thorns. Shrieking and bleeding they jump out again this time wondering why the mother and father who love them so much are torturing them. Next, mother eagle pushes them off the cliff into the air. As they shriek in fear, father eagle flies out and catches them up on his back before they fall and brings them back to the cliff. This goes on for sometime until they start flapping their wings. They get excited at this new found knowledge that they can fly. The preparation of the nest teaches us to prepare for changes; The preparation for the family teaches us that active participation of both partners leads to success; The being pricked by the thorns tells us that sometimes being too comfortable where we are may result into our not experiencing life, not progressing and not learning at all. The thorns of life come to teach us that we need to grow, get out of the nest and live on. We may not know it but the seemingly comfortable and safe haven may have thorns. The people who love us do not let us languish in sloth but push us hard to grow and prosper. Even in their seemingly bad actions they have good intentions for us. When an Eagle grows old, his feathers become weak and cannot take him as fast as he should. When he feels weak and about to die, he retires to a place far away in the rocks. While there, he plucks out every feather on his body until he is completely bare. He stays in this hiding place until he has grown new feathers, then he can come out. We occasionally need to shed off old habits & items that burden us without adding to our lives. See you again, Have a wonderful day!